Okay, so… I knew this would happen. Now that I’ve started to blog, every time something happens I think “Oh, I need to put that in my blog!” That means that at least this time around (and probably in future times, at least some of the time) you get a running commentary on my week. Wonderful ground cover – taking over a whole corner under the kitchen windows. Anyone know what it’s called? 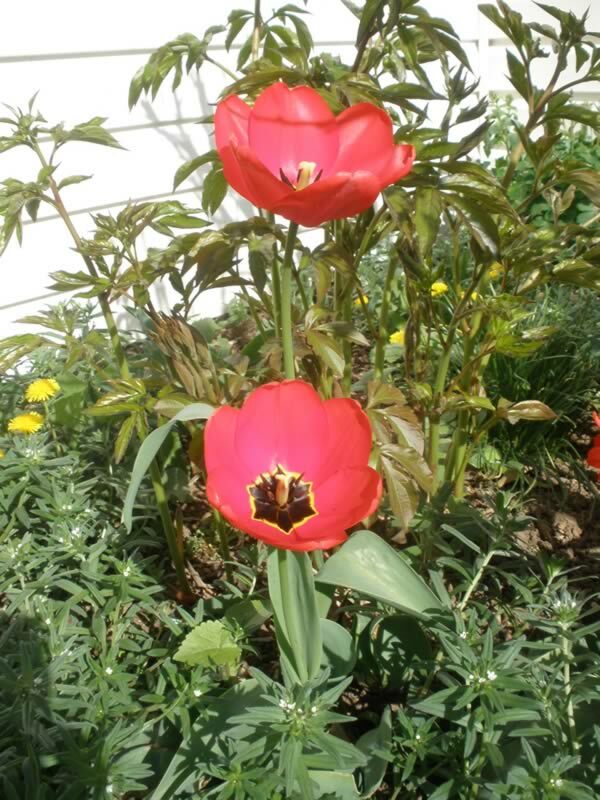 I know this one – tulips! Trainer Carla Herbert was visiting from Florida for a private intern week, and we had a lot scheduled. 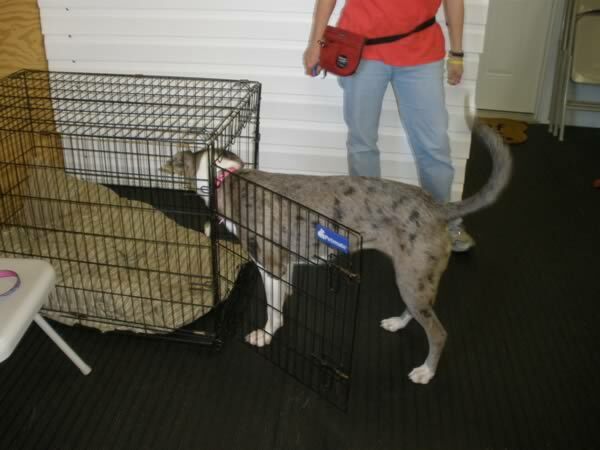 She brought along one of her dogs – a Catahoula Hound named Kona, and we worked a little every day on various behaviors, including the one depicted below in pictures – shaping her to go into her crate. 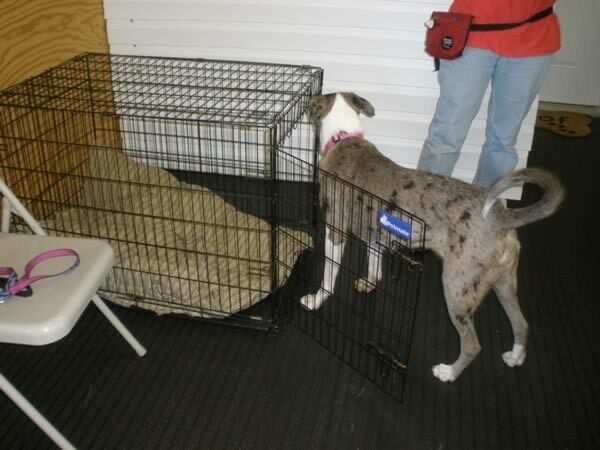 I noticed on Day One that she was hesitant to crate up, so we added that to the list of things Carla wanted to work on, and by Thursday Kona was happy to trot into her crate on her own. 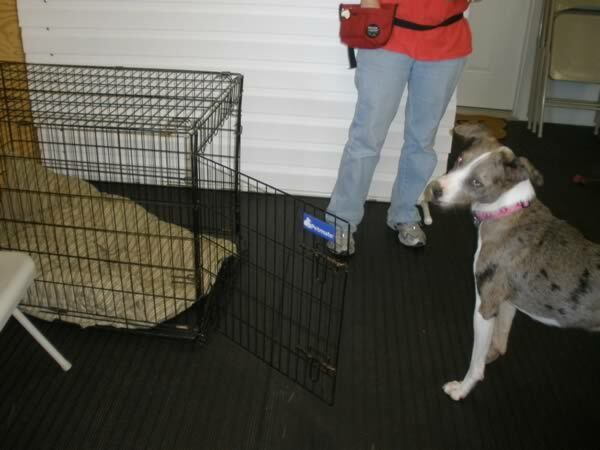 Yay – treats get tossed away from the crate! Now I get treats *in* the crate. By Thursday, Mom can even close the door! 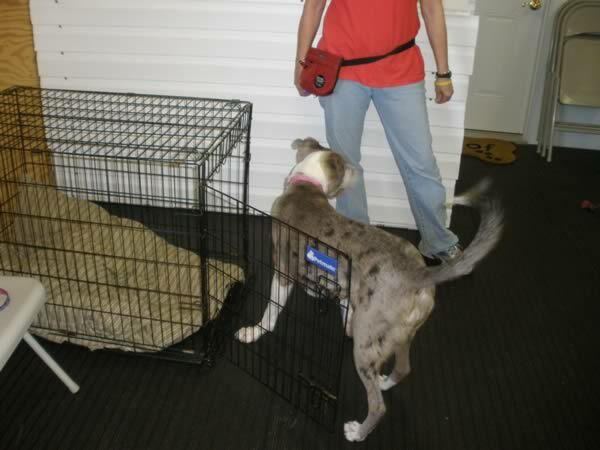 Monday afternoon I had a return client – an 80-pound dog who barks and lunges at other dogs – and people. This was his third visit, and while he’s made some progress, I know he could do better. I switched his owner from straight counter conditioning to more of a Leslie McDevitt “Look At That” approach, and it seemed like a better fit for both of them. After shelter behavioral assessments on Tuesday morning, we met with the Behavioral Foster Care Committee. This is the still-embryonic program I referred to in my last blog. We’re going to call it GOLD Paw (Giving Opportunity, Love and Direction), and are looking forward to a September launch by the time we get all our ducks in a row. Meanwhile, shelter staff is already on the bandwagon – when I was at assessments this morning they were advocating for three dogs to go to behavioral foster homes – foster homes that don’t exist because the program isn’t up and running yet. But at least one of the dogs – a three-month-old Pit puppy – will come to our Level 1 Training Academy next week instead of being euthanized. Wednesday and Thursday we had several interesting privates. A lot of intra-pack aggression cases (can’t decide if I’m getting more of these clients because I wrote on that topic in a recent WDJ article, or if I wrote on the topic because I am getting more intra-pack aggression clients), and one dog-human fear-related aggression. I do tend to have a preponderance of aggression and reactivity clients, but have never seen this concentration of aggression between dogs within the same home. Increased exercise and play opportunities for the youngster with age and play-style appropriate dogs – perhaps a candidate for doggie daycare. Pain medication for a dog who is so arthritic she can barely walk. Feed the dogs in separate rooms to avoid resource guarding. 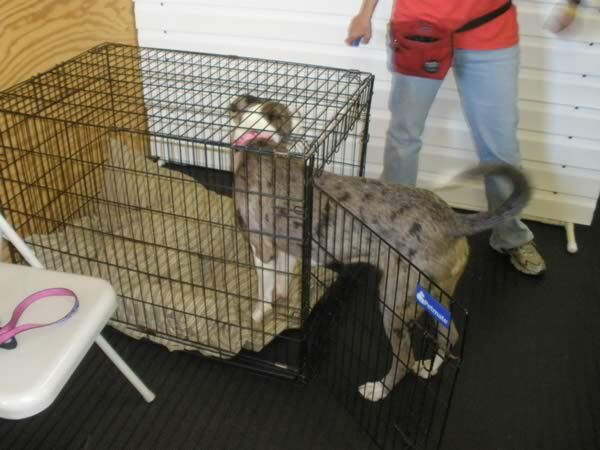 Sad to see good, caring owners who hadn’t realized the impact the addition of an energetic young dog would have on the quality of life of the two seniors, and who didn’t realize the importance of management when they did bring the youngster in, to prevent escalation of emotions to the point of serious fighting. And who have allowed their senior dogs to live in pain because more than five years ago a vet told them that Rimadyl would kill their dog. 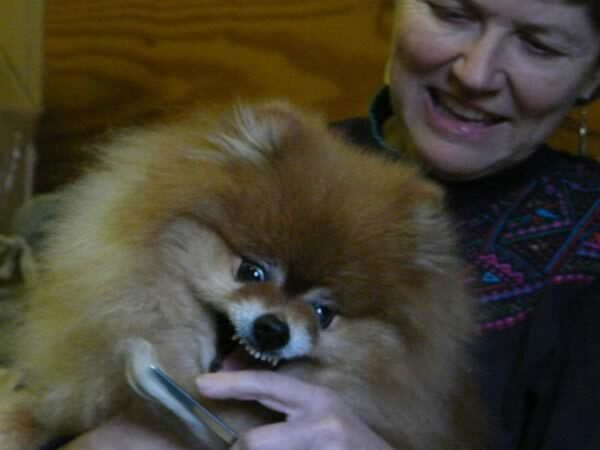 Last week I was also in the middle of writing an article for Whole Dog Journal on bite inhibition, so I asked Carla to take some photos of Scooter, our Pomeranian, biting me as I groomed him (below). Scooter has fantastic bite inhibition, so while he looks like a demon dog in the photos, you can see me smiling, because he never actually puts pressure on my skin with his teeth. And yes, this is the closest to a Dog Whisperer set-up that you’ll ever get from me. I *really* hate being groomed! 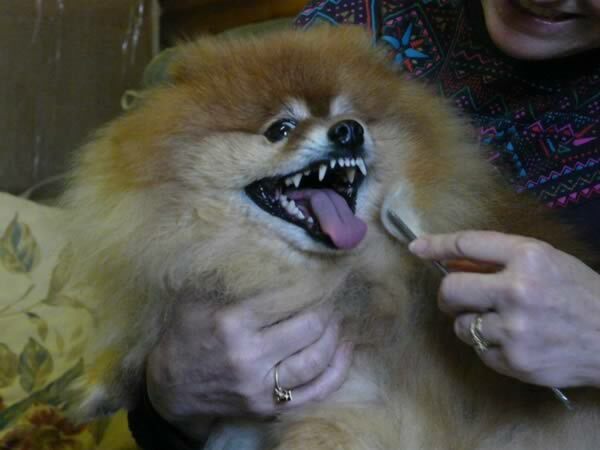 I *really* hate being groomed and I am *very* fierce! As Carla and I traveled around Maryland and beyond last week, we twice encountered dogs on the edge of the highway – always a heart-stopper. The old Humane/Animal Control Officer in me doesn’t let me drive past a dog on the highway, so of course we had to pull over both times. The first was a small Terrier mix, limping on three legs on the right shoulder as we were headed south on Hwy 81, at Exit 5. We had already passed the dog, so we had to do a three-loop cloverleaf to get back to where we had seen her. When we got back there, she was gone. I pulled the van over onto the curb of the highway on-ramp, and we got out and started up the hill. Carla said, “There’s a person up there…” and sure enough – there’s homeless man living up there on the hill in the woods. I hiked up anyway, and he was sitting in a camping chair in front of his makeshift tent, clutching the little dog in his arms. “She’s my dog,” he said defensively, and I assured him we were just making sure she was okay. “Do you give him food for the dog?” I asked. (Our shelter has a food bank). So now, they are arranging to drop off food for her, and have found a vet who is willing to donate pro bono vaccinations for the dog. They are also going to help clean up some of the garbage that has accumulated around his camp. All is well at Exit 5. We saw the other dog on the side of a Pennsylvania highway on our way to see Dr. Karen Overall (more about that in a moment). Reddish-colored Pitbull on the shoulder, no collar, no tags… dashed back down the shoulder when I pulled over to try to coax him to me. Fortunately, Carla spied a young man walking toward us some distance up the road, so we drove up to him. He said it was his neighbor’s dog, and he was trying to get her back home. We handed him the only leash (good quality leather!) I had in the car, crossed our fingers, and continue on to Karen’s. (Note to self – keep cheap leashes in all vehicles at all times!) Since the dog was clearly frightened of us, we didn’t think it would be of any use to try to help him, so we continued on our way. We hope all is well on that Pennsylvania highway. Reassuring to see two dogs we thought were in trouble who actually had humans looking out for their best interests, even if we did see them at high-risk moments. A friend of mine on the West Coast was not so fortunate. Cheryl Syring was driving home at night with a friend and they saw an elderly yellow Lab in the road in the path of an oncoming car. They flashed headlights and jumped out to try to wave the driver down, but to no avail – he slammed into the dog, and the dog died a short time later. In all my years in Humane/Animal Control work and the years I’ve spent since, rescuing dogs from roads, I’ve never had that happen. I cannot even imagine how horrifying that must be. Ending on a happier note… our trip to Karen Overall’s home outside Philadelphia was to sit in on a consult I had referred to her – a client of mine with a drop-dead gorgeous Belgian Malinois who suffers from generalized anxiety disorder and an elusive liver problem. First time I’ve ever had the privilege of sitting in on a Karen Overall consult, and it was more than worth the three-hour drive each way. Although this young Mal was found stray last Fall, Karen agrees that he is an extremely well-bred dog, and was intrigued by the mystery of how he might have come to be a stray. Karen Overall is in my “goddess” category, and with this gem of information she has given me a whole new way to look at, and explain, various dog behaviors that are often troubling to clients. 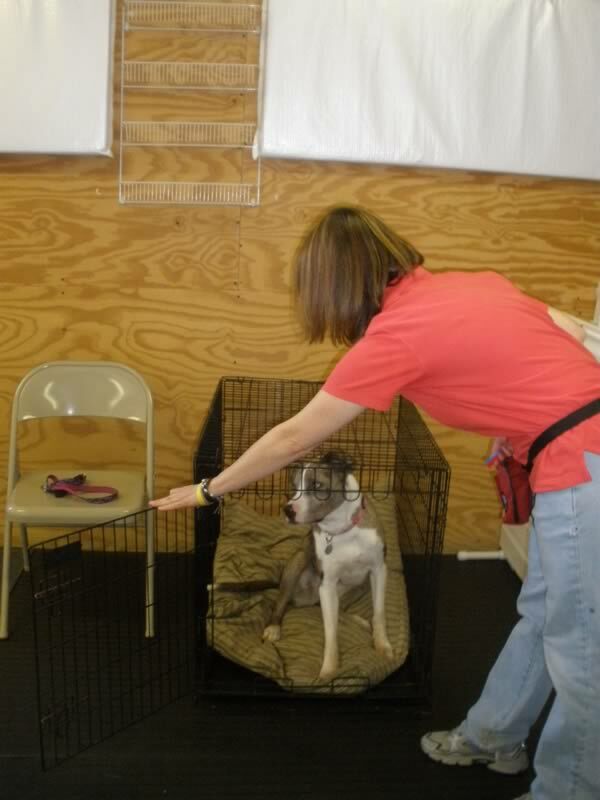 Thanks to Karen for being an inspiration and a leader in the positive dog training and behavior world! I’m sooo glad the trip to Dr. Overall went well; and I hope great things are in this dogs future. He is an amazing dog. He is an incredible dog – and I was glad Karen said that about him as well. His humans are really trying hard to do the right thing for him. I second your comments about Dr. Overall – she has some amazing insights – and the one about dogs seeking information was so relevant to me too when I met with her about my dog, Molly, just a few days before your appointment. In fact, it was clear to me how much Molly is scanning her environment outside, looking for/checking out possible activity that could be threatening. The other insight that struck me also was how important it is for anxious dogs to have the ability to relax so they can better learn alternate behaviors to being reactive. Yes. I love her “Hold your breath-breathe” exercise. Pat, I love the blog, stumbled on it looking for other classes for Samantha (I’m SURE we’ll pass Intermediate this time, haha!). Flower no. 1 looks like phlox, tree is Yoshino cherry I think. Both beautiful. 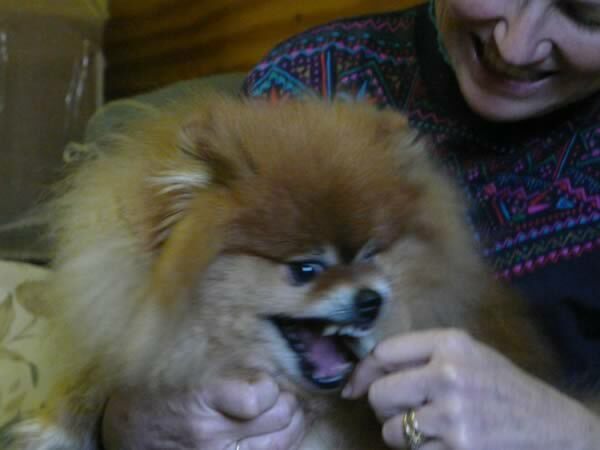 How would an owner know growling is seeking/offering information vs. aggression? Just curious. Thanks Rick! 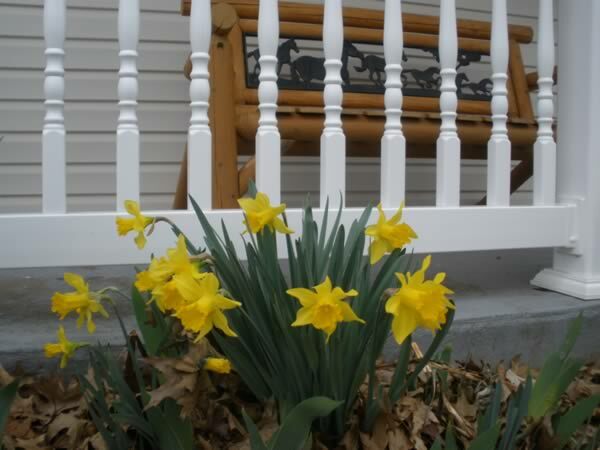 #1 is some kind of succulent – I was thinking a sedum – is phlox a succulent? 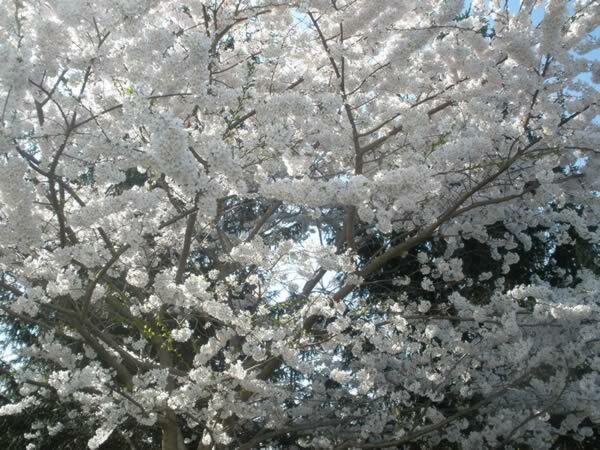 The tree never bears fruit – is Yoshino cherry a flowering-only tree? I *expect* you and Samantha to pass…! For information-seeking growls v. aggression growls you look at body language and intent. With the Malinois, she showed no indication of wanting to escalate or follow through with increased insensity of behavior after her growl – although if she were pursued and cornered I have no doubt she might bite. Pat, as a former 3x student, I have enjoyed everything you have ever written, but I particularly enjoyed this blog. Thank you for sharing the comment from Dr. Overall. This was good insight for me since I enjoy working with dog’s with communication problems most of all. Thank *you* Elta! I just spent a great week with your friend Ann Marie Easton – watch for her on next week’s blog! I really enjoyed your observations about the intra-pack issues. Last May we brought home an Irish Wolfhound puppy. Our white German Shepherd/husky mix turned 6 last year and this was the second IW for our household. Aspen did not enjoy the experience the second time around. Isabella (IW) wanted to play so badly that she would bark and bark (right in Aspen’s face) to try to tempt Aspen to play with her. It didn’t work out very well. Finally, this past January we added a third dog to the mix, fostering a young (2 year old) Afghan Hound named Pharaoh. What a blessing! Young Pharaoh and Isabella (now 1 year old) have similar play styles (both are sighthounds); love to run together and are the best of friends. Mellow Aspen loves to bark at them while they play and now she gets to watch the young ones run, and she enjoys the peace. What a win-win solution. And we formally adopted Pharaoh. Isabella just needed an age-appropriate playmate. Lucky Pharaoh and Isabella… It’s a blessing and a delight when dogs find compatible playmates! Great Blog Pat!! Flower #1 certainly looks like Phlox subulata ‘Blue Emerald’. 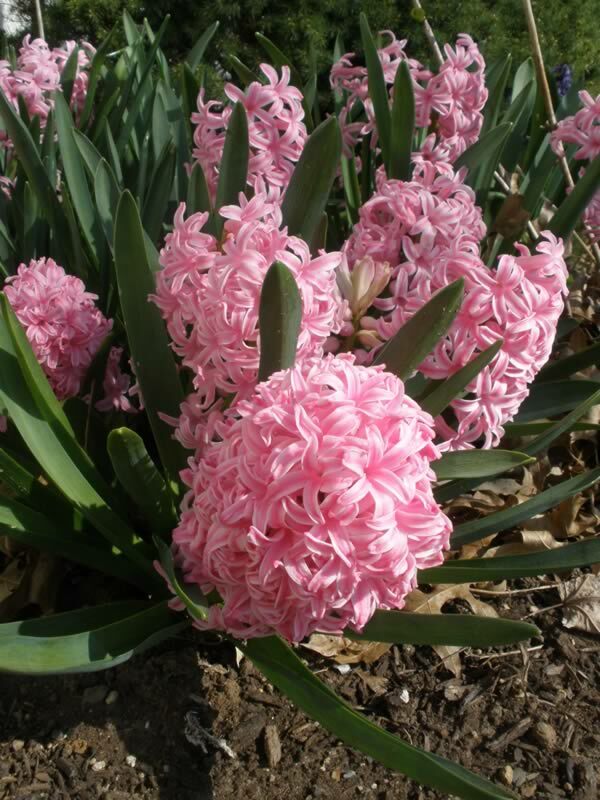 Better cut some of the wonderfully fragrant Hyacinths for the new sunroom! 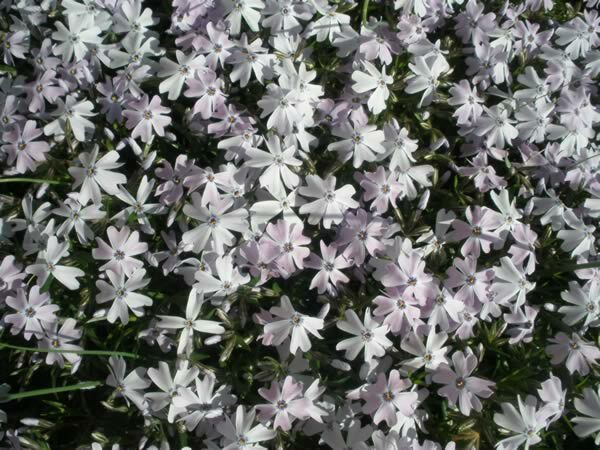 Good to know – Phlox. Rick – was right! Too late for the Hyacinths, but the Iris will be out soon, and then Peonies.